Baby Bjorn is a young man who has gone through more medically than most adults at a very young age. Bjorn was diagnosed around last Egg day with "mixed", meaning two types of Leukemia. While Baby Bjorn continues his fight, his family and friends are by his side; helping with fundraisers for the family to continue their financial struggles of having a very sick little one. David's company has been very kind in allowing David to take time off. He will have his job waiting for him when he returns home. Amy, however, will need to be home with Bjorn. All of the complications that go along with Bjorn's struggle will require a mother's love to help him. Amy, Bjorn's mom, stated "we arrived on January 2nd with Bjorn to start the transplant process. There was a jam-packed and exhaustive evaluation process pre-transplant to check Bjorn from head to toe for any underlying health issues and complications. CT scan, MRI, EKG, EEG, ECG, dental exams, neurological exams, daily blood draws and cultures to check for viruses and illnesses. All of this to check the process of his cancer." "Bjorn did not have a match on the world registry for bone marrow, the doctors had to opt for an Umbilical Cord Blood Transplant (UCBT). UCBT have historically difficult problems when being compared to Bone Marrow Transplants (BMT). One of them being that cells take much longer to engraft and the immune systems takes far longer to come in fully," continued Amy. 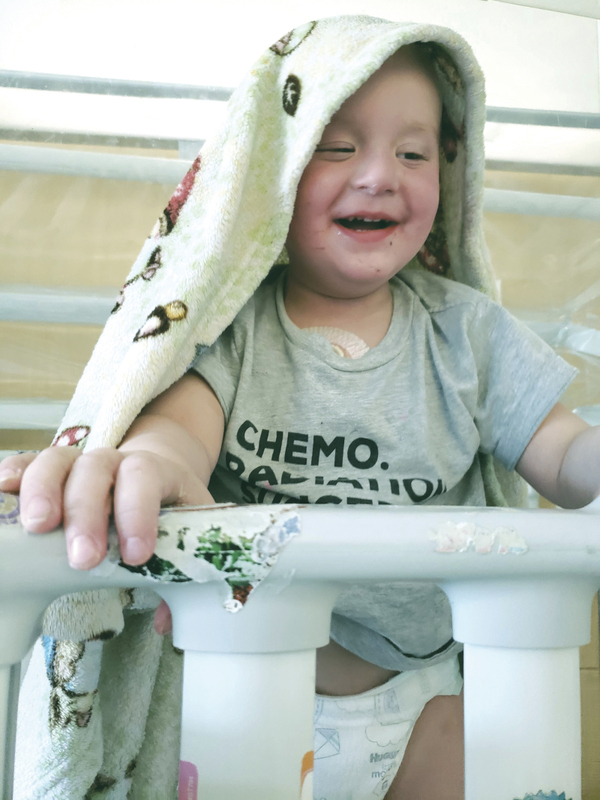 "Due to Bjorn having mixed phenotype meaning he has both Acute lymphoblastic leukemia and Acute myeloid leukemia markers active giving a huge concern is his leukemia reactivating after his transplant and failing. Bjorn only had one unit of cord blood found for him and 0 BMT, and an auto (self celled) transplant is out of the question since his type of cancer is a blood cancer," explained Amy. "Bjorn has already gotten a severe case of Mucositis which landed him in ICU with nausea that leads to violent vomiting and incredibly low energy. He sleeps 18 hours a day on his bad days and on his good days he can be up for about 8 hours. He is on a morphine drip for his pain and gets doses of it just to be able to move because transplants are very painful on your body." stated Amy, Bjorn's Mom. "His liver enzymes are very high; he has several medications trying to lower the risk of liver failure. He has HVV6 which is a spinal and brain virus that gave him a 105-degree temp for over two weeks and is still active. It can lead to CMV activation which is fatal in transplant patients," continued Amy. "It is obvious Bjorn is having a hard time. He wakes up screaming and crying from pain. This poor little guy has a hard time keeping food down. All he wants to do is run and play like a healthy child. Often he asks to go home when his parents are near the front door," per Amy. The family is asking for prayers for Bjorn, remember to pray for Amy and David Roth as well. This is hard for any family to go through and we all believe in miracles. This family is in need of a miracle. If you would like to help financially and help a young man who is struggling with Leukemia, there will be fundraising breakfast on April 6 from 8:00 am to 10:00 am at the Chehalis Applebees. Breakfast will be $10. Tickets can be purchased from Evie Leef at her All-State office off of Highway 505 and Morton Road in Winlock. Extended family has set up many other ways to gather support for Bjorn. You can help by purchasing rubber bracelets, parachute bracelets, embroidered hats, T-shirts, and window decals from Evie Leef, Judy Godby, and Dana Bryant; all of which help show the community your support for Baby Bjorn too. There is an account set up at KeyBank for Bjorn that you can donate to by asking for the Bjorn Roth private account. The Go Fund Me account can be found under "battle-leukemia-with-Bjorn" or by typing gofundme.com/battle-leukemia-with-bjorn into your web browser.